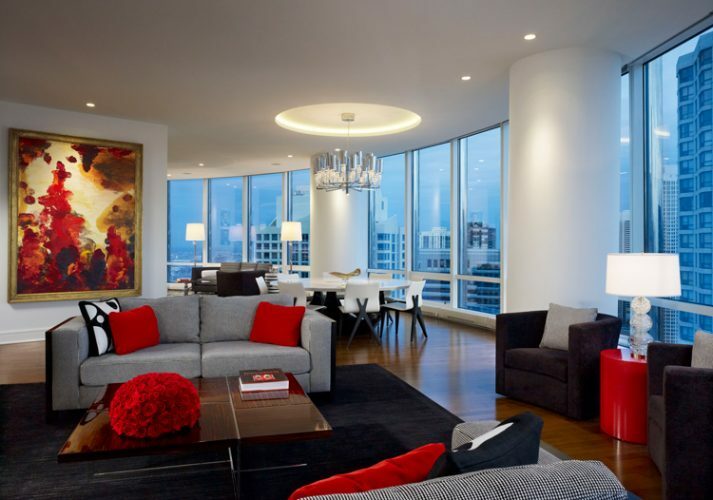 I’m pleased to share with you a current residence we are designing for our 25th client at Trump Tower Chicago. It is an interesting and challenging commission for many reasons. 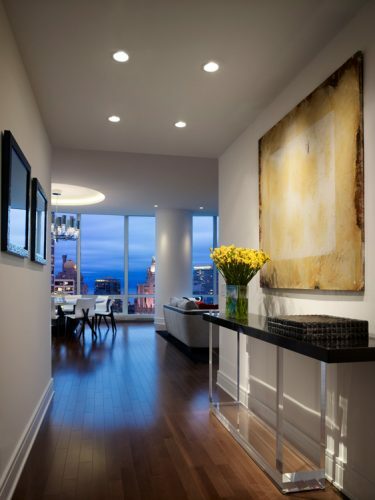 A client of ours from Dallas purchased two adjacent condos to combine into one larger home. 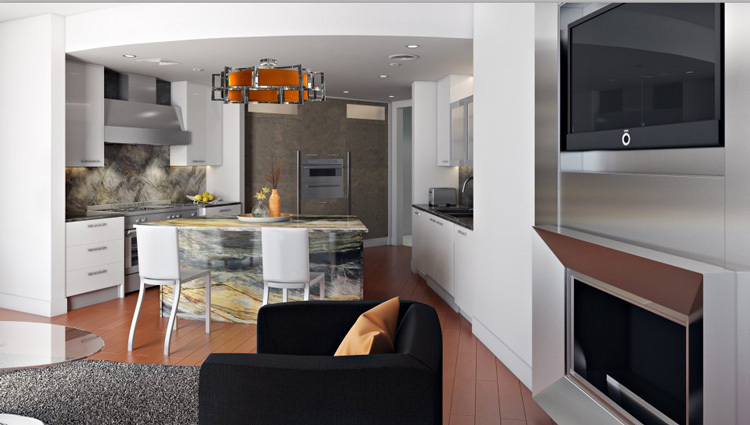 He bought a 3,400 square foot residence we had designed for previous clients plus an adjacent 600 square foot studio. He had seen several other listings in the building, but fell in love with this home the minute he entered it. A. New floors, black lacquer cabinets including the island, and quartzite counter tops. B. 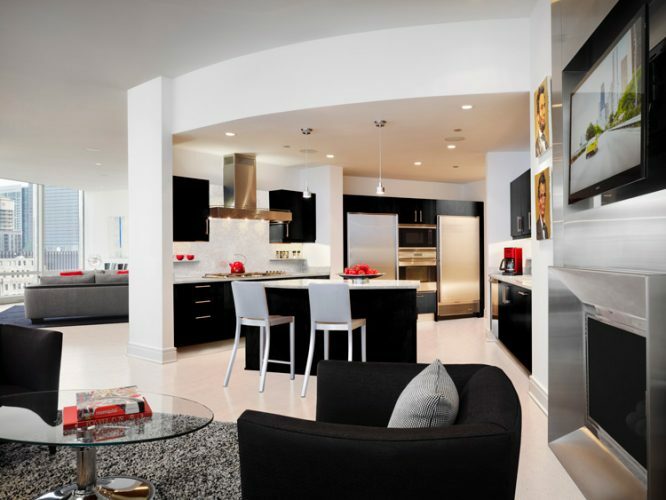 A combination of white lacquer and stainless steel cabinets with glass inserts above the sink and a black lacquer island. C. White lacquer cabinets, silver textured floor to ceiling refrigerator/freezer doors, a quartzite island apron and matching counter top. 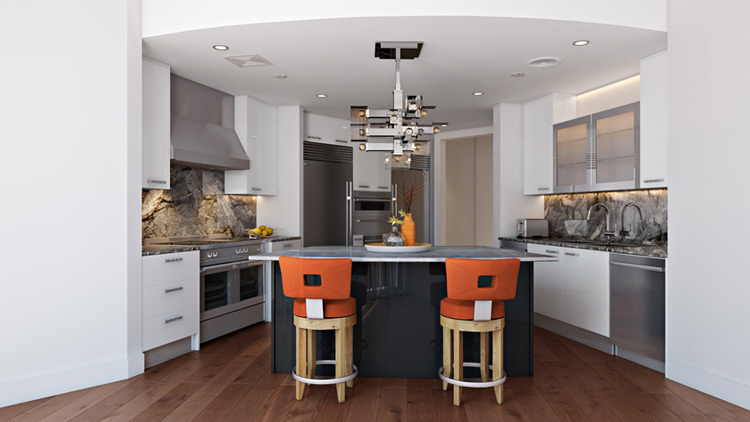 Our clients chose C. They selected the slabs they liked for the counter tops and backsplashes while we coordinated the finishes making certain everything went together. That process is an extremely important piece of our path to creating a space to satisfy our clients tastes and desires. Here’s the foyer we designed for the previous owners. The buyer did not like the acrylic console that we selected for the previous owners. 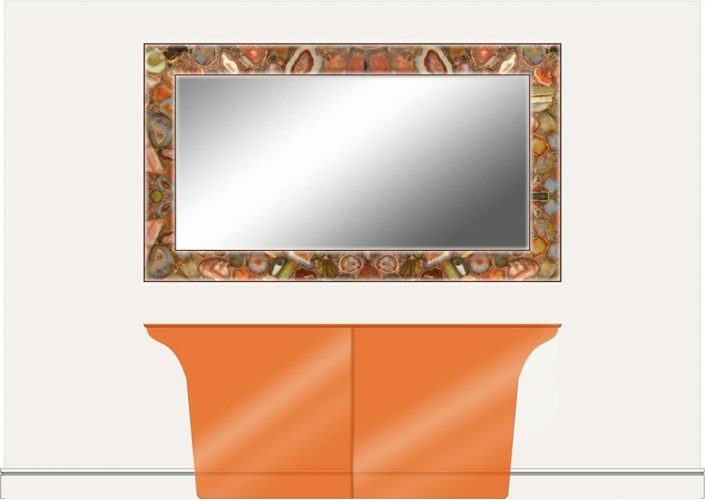 Instead, we created a backlit agate mirror with a custom colored glass console. Both pieces are currently in production. The entire living room that we designed for the previous owners moved to Texas. 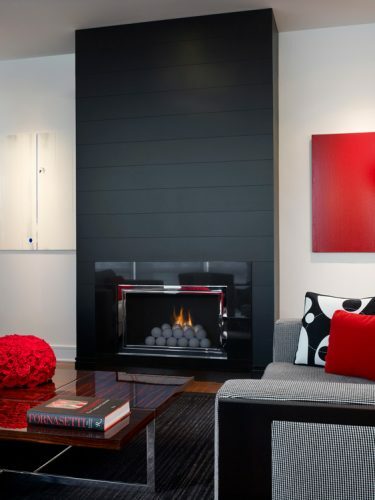 An important architectural focal point – the sandblasted, black glass fireplace – remains. It integrates beautifully with our new owners’ furnishings and personal design concept. 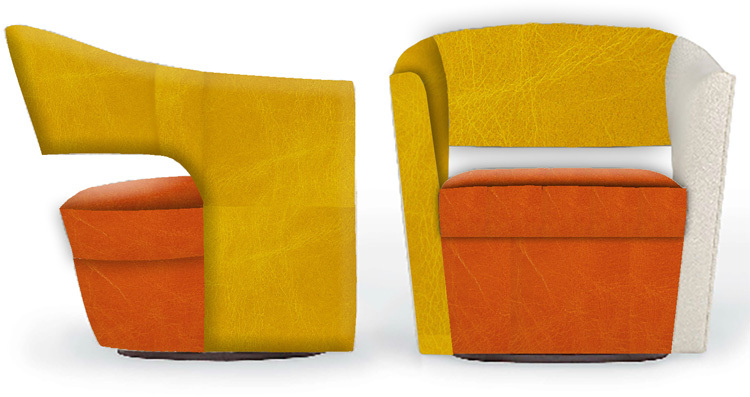 …and a pair of swivel chairs upholstered to our custom specifications. Behind the swivel chairs is a Planar television which is also a white board installed above a black lacquer and stainless steel floating cabinet. These two items are flanked by a pair of Bang & Olufsen BeoLab 90 SPEAKERS (the newest loudspeaker from the venerable Danish consumer electronics company). Each speaker has 18 drivers—seven tweeters, seven mids, and four woofers. 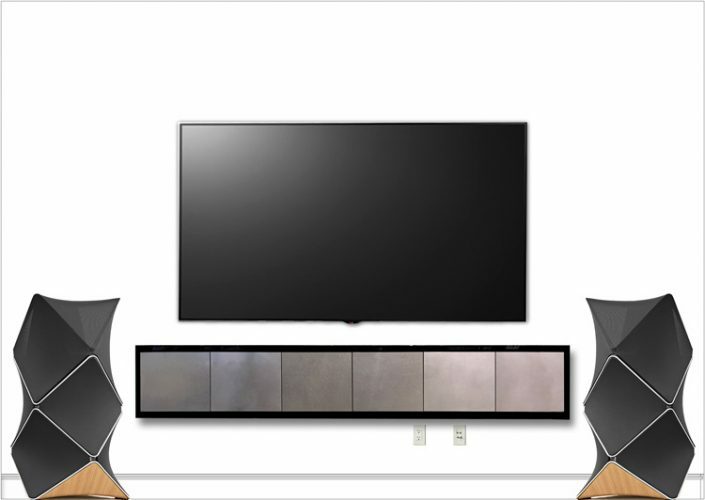 The home’s entire audio/visual system is being completely revamped and features exclusively B and O’s arresting design in every room. 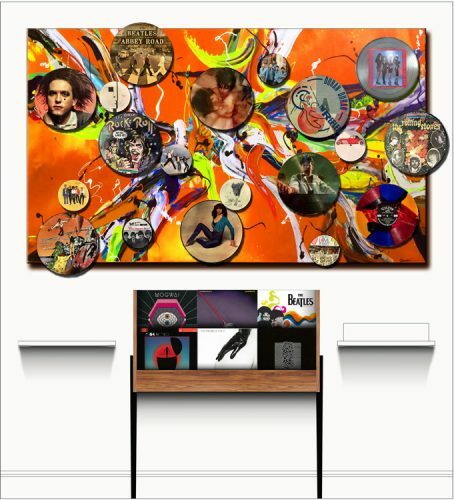 Inspired by music his entire life, the client has an awesome collection of 7 and 12” picture discs and a vintage B & O record player in a white lacquer case. 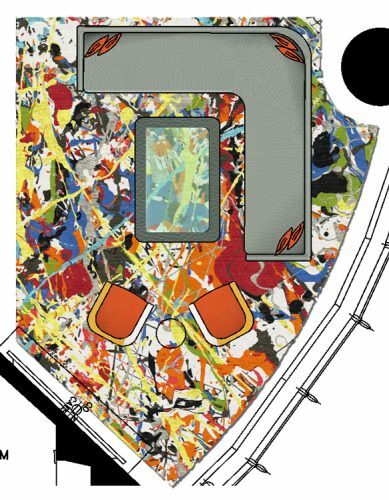 It goes on the wall opposite the big screen television coupled with a custom designed interactive work of art. 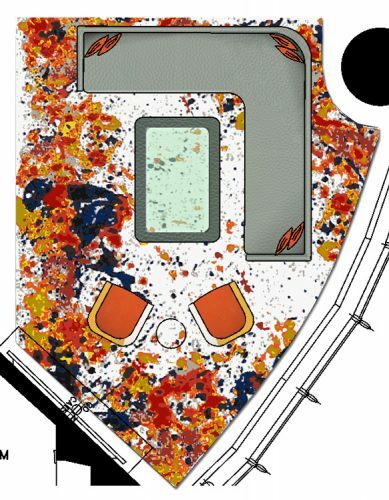 Many more plans, drawings and details have also been prepared for the renovation of our design for the previous clients. This is another example of the expertise John Robert Wiltgen Design, Inc. exhibits in integrating art and architecture with design.